Best of the Week: McIntosh CD player, Pro-Ject Essential II turntable, HDR10 vs Dolby Vision and more | What Hi-Fi? 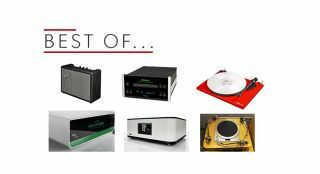 This week T+A announced two new streaming systems, McIntosh expanded its range of high-end components with the MTC80 CD transport and over 50,000 rare vinyl records have been archived online for your listening pleasure. For reviews, we have Convert Technologies' Plato Class A all-in-one system, Pro-Ject's Essential III turntable and Fender's Monterey wireless speaker. The German audio brand has expanded its line of products with the CALA SR and CDR streaming systems. The biggest difference between the two is that the CDR comes with a CD player, while the SR focuses on streaming. Both can stream in FLAC, WAV, ALAC and AIFF files up to PCM 32-bit/192kHz over wi-fi or ethernet, with built-in support for streaming services too. New York's ARChive of Contemporary music and the Internet Archive have teamed up to preserve 50,000 rare records online. It's part of the Great 78 project, which is looking to discover, research and preserve 78rpm records. So far they're part way through digitising the 200,000-strong collection. You can dive into the collection and listen to the records with all their imperfections and surface noise still intact. McIntosh has expanded its high-end component range with the MTC80 CD/SACD transport. It supports CD, SACD, CD-R/RW playback and comes with coaxial and optical inputs. McIntosh claims it can read a disc's audio at twice the normal rate for more accurate disc-tracking and error-correction. The MTC80 will be available from November, priced £4495. "Pro-Ject simply can’t shake the habit of turning out top-class turntables"
Pro-Ject's Essential range has had great success, so can it repeat that with the Essential III? Absolutely. Pro-Ject has turned out another top-notch budget turntable that's easy to set-up and offers an impressively open and detailed sound. The plinth isn't the most rock-solid, but even so, it's another excellent deck for the money. "It’s well made and, once you’ve got a hang of the Android OS, fairly easy to use"
This all-in-one system is hugely versatile, and capable of playing music and films. You can stream, play from a record player or use the DVD drive for CDs and DVDs. However, there are issues with the system's clinical sound, the omission of Bluetooth and a disappointing video performance. It's a thoughtful attempt at eschewing traditional hi-fi boxes, but falls short of being a resounding success. Worth a try, though. "It’s never less than a warm and friendly listen"
Fender is known for its electric guitars and amplification equipment, but the Monterey is the company's first foray into wireless speakers. The design recalls a guitar amp, with a performance that's capable of impressive tonality and decent detail. However, there's a lack of skill with rhythm and flow, ensuring it falls short of its rivals.